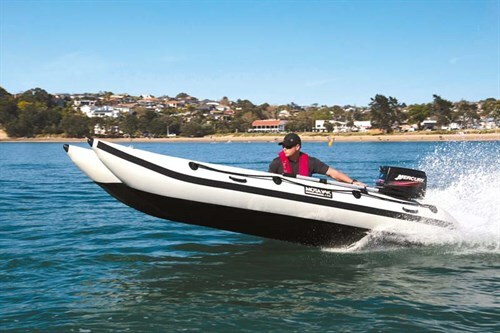 The Motayak inflatable boats range offers fun, practicality and quality boats at bargain-basement prices. 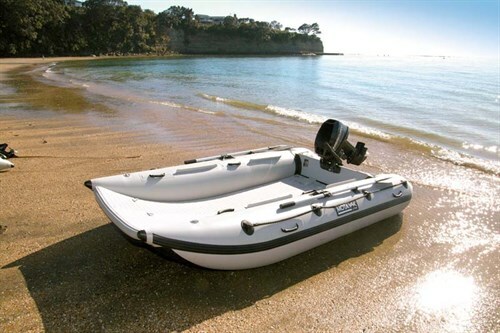 Small inflatable boats are commonly regarded purely as utility vessels – typically as tenders for yachts or marina work boats. However, the new range from Motayak Boats intends to change that – fun vessels that are serious boats without breaking the bank. We spent a fun morning on Brown’s Bay beach having a look. Motayak managing director Jamie McKenzie is passionate about having fun on the water while staying safe at the same time. He says traditional small inflatables are often only suitable for calm water, are slow and take too long to inflate, while racing inflatables like the Thundercats are expensive and require specialised trailers. The Motayak range aims to solve all these issues. The first consideration was stability and safety, and all the models feature a twin-pontoon (catamaran) style, with a broad beam. 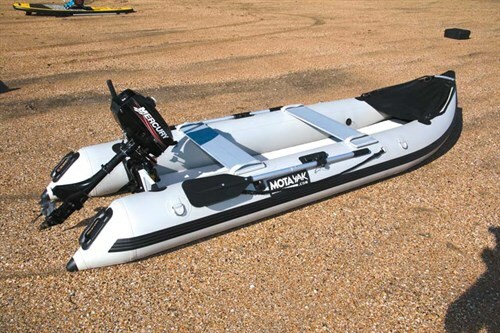 This design maximises stability, with even the smallest model having a firm inflatable floor that is stable enough to stand up in – this isn’t possible in many other inflatable boat designs. 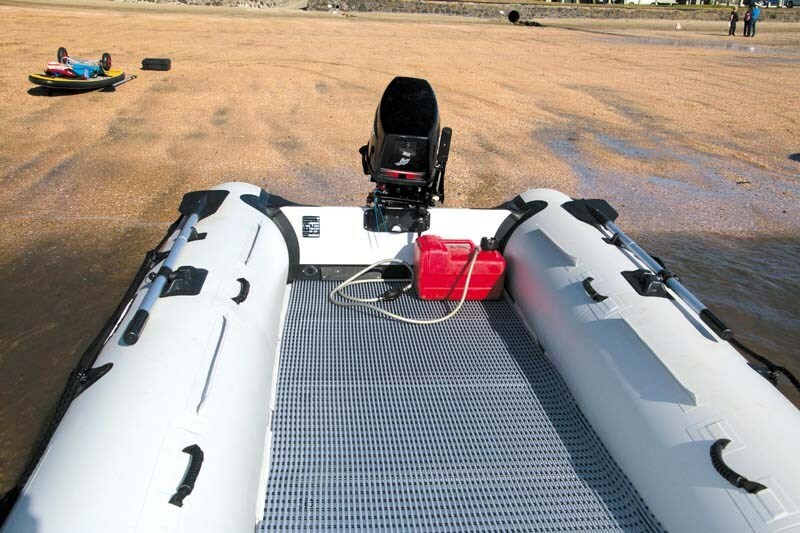 At the same time, the narrow pontoons provide unrivalled performance, with minimum wetted surface and hence low drag. As a result, smaller motors are required, which reduces the up-front expense and ongoing running costs. However, this is not at the expense of fun, with white-knuckle speeds possible for those who enjoy their adrenaline rush. All Motayak models share some common features: the tubes are constructed of tough UV-resistant PVC; rugged rubbing strakes along the outside help prevent damage when coming alongside a wharf or another vessel, while a similar strip along the underside of each pontoon offers protection when pulling up on a beach; grab handles on the inside and rope grabs along the outer hull make them easy to lift or get into; and the inner deck on all models is covered in a thick layer of EVA foam. This feels great on bare feet but is also rugged and UV-resistant, remains non-slip even when wet, and absorbs sound and vibration for a smoother ride. All models are easily folded up into handy carry bags. The set-up process takes as little as five minutes, especially with the optional battery-powered air pump. While bigger models require two people to lift, they are all easily transported in the back of a car or wagon, which saves the expense and hassle of a dedicated trailer. The big brother of the Motayak range is capable of serious expeditions. At an overall length of 4.1m (13ft 6in) with 2.4m (8ft) beam, it has masses of space and would be suitable as a fishing, diving or water sports platform. This boat has the largest transom, perfect for rod holders, boarding ladder and the like. A fibreglass nose cone provides additional rigidity as well as the potential for fitting a bollard for tying off an anchor. 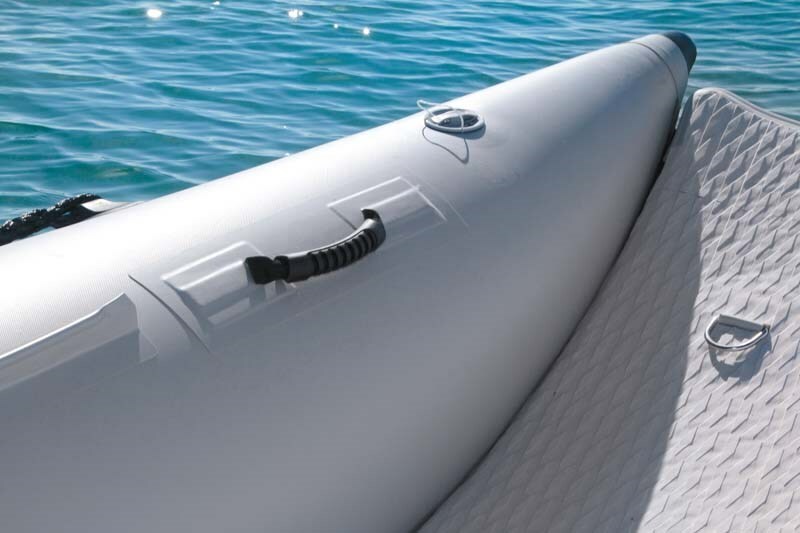 A small extra inflatable rail under each pontoon acts as a keel, enhancing the steering and cornering at speed. It also features a plywood floor under the same soft EVA deck, adding rigidity. With its larger size and weight, this model sits more firmly on the water and is comfortable for extended travel. The review boat had a 30hp Mercury two-stroke motor, although a four-stroke could be fitted. This motor easily propelled the boat into the upper 20kt range, delivering a thrilling ride, but when kept to more moderate speeds the broad beam and narrow pontoons make it stable and comfortable. Pushing the boat into tight turns brings those extra rails into play, and the boat can turn 180 degrees in just over its own length. This is ‘hold on tight’ territory. The boat sits very flat on the water, so there’s little danger of overturning if you get it wrong but loose items could easily be flung overboard in a too-sharp turn. 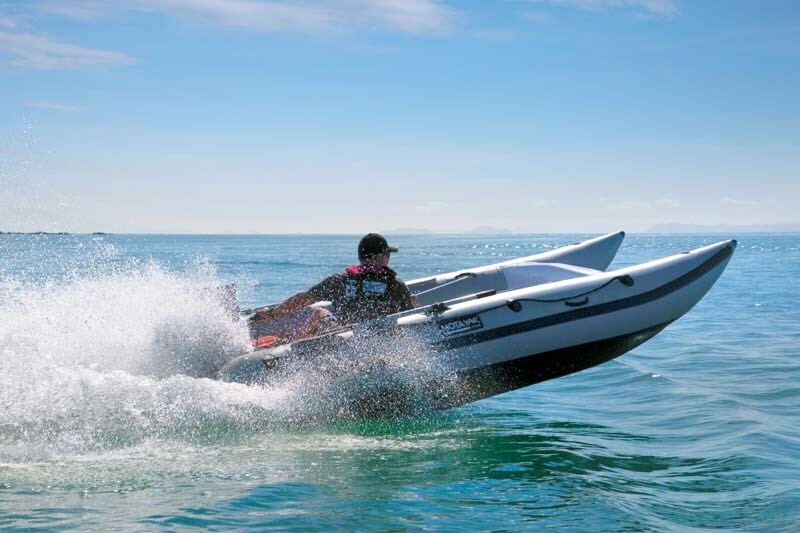 The Adventure Cat shares many features with the popular Thundercat racing boats, including the ability to handle huge seas and rough surf. Like most cats, the space between the pontoons traps air so launching off the back of a wave doesn’t result in a bone-jarring crash but rather a gentle ‘woosh’ as the air cushions the landing. It could be beach-launched in just about any conditions, and would doubtless make a good surf rescue boat. Although like its siblings it’s completely collapsible and folds into a single bag, it could be also left inflated and carried on a small trailer so it was ready to use at a moment’s notice, making it a fully capable vessel. One of the most amazing features of the Adventure Cat is the price. The base boat is just $2999; a package including the 30hp Mercury two-stroke outboard comes to $7995. The Motayak Minicat looks like a baby racing Thundercat – twin ‘pencil’ hulls with a flat deck between them. Rated for up to four occupants, this boat looks fast and with the 15hp Mercury two-stroke and only one passenger on board, it certainly is. Skipping across wave tops is fun and comfortable thanks to the air cushion that forms between the pontoons. Sharp turns are possible with the tiller-steered motor so take care to hold on tight! The boat is forgiving, however, and hitting a wave too fast is generally not a problem. Despite the modest 3.3m length (10ft 9in) there is a surprising amount of space thanks to its 1.96m (6ft 6in) beam. This would make an awesome swimming or diving tender. The firm inflatable floor, covered in the soft EVA foam pad, is extremely friendly to feet and knees. It’s equally comfortable seated on either side pontoon or on one of the thwarts while steering. There is no specific provision for anchoring but a small folding anchor could be tied off to any of the numerous handholds and deployed. At 52kg, the folded-up boat is too heavy for a one-person carry but is easily and quickly set up in about 10 minutes. The 15hp motor is also luggable, and this is probably the ideal boat for a family holiday bach. Once inflated on the beach, it could easily be dragged down to the water every time it’s needed. 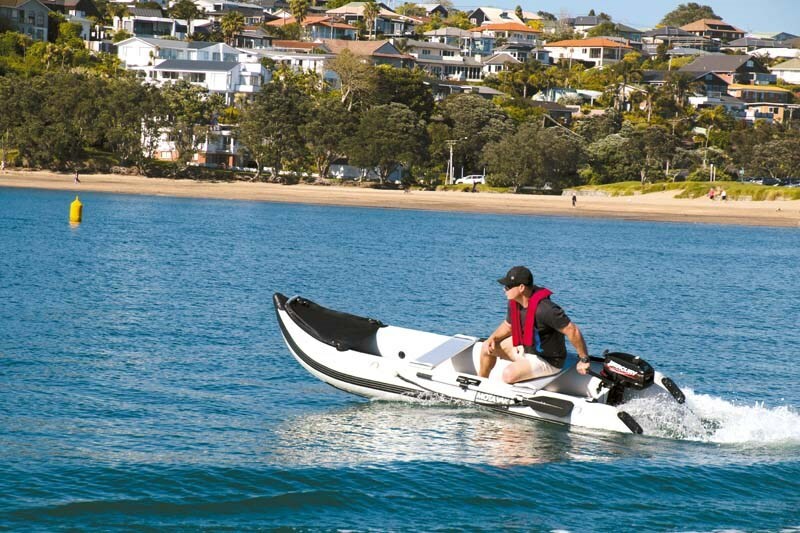 The Minicat’s modest price means it competes head-on with the midrange inflatable tender market. Given the stability and space this boat provides compared to a similar monohull dinghy, plus the quick and easy set-up, it may make sense to invest in one for your yacht or launch instead. At a glance, the Sport looks like an inflatable kayak on steroids. However, it’s far more than this, with a 1.05m (3ft 5in) beam, inflatable EVA-covered inflatable floor that can support a person standing up, and a solid transom. 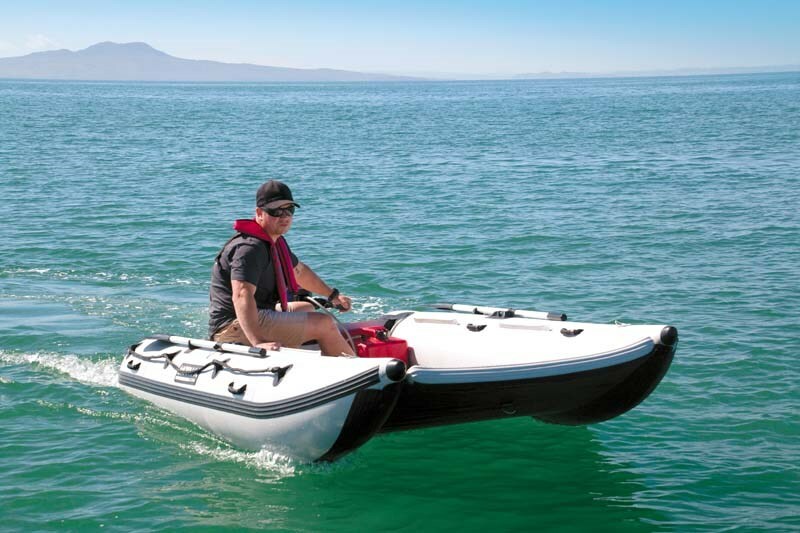 This combines the flexibility of a kayak (it can easily be paddled like one) with the capability and range that only an outboard motor can provide. We tested the 3.65m model but it’s available in three sizes, with longer 4.3m and 4.7m siblings. All have the same tough PVC construction with reinforced side and bottom rubbing strakes. A bow bag is available as an option to hold gear securely, and paddles are clipped to the sides. What makes this boat superbly stable for its size is twin pontoons with a semi-rigid floor in between. Unlike a round-bottomed kayak, this sits flat on the water no matter what the load is. During our test, a prospective buyer took the boat out behind the wave break and stood up, testing the action of casting a fly rod. What sold him on the model was when he found that not only was the floor sufficiently firm but the boat was also stable enough to do this in relative safety. We had a new Mercury 3.3hp two-stroke motor fitted, which propelled the boat easily. Although we weren’t able to accurately measure the speed, we seemed to get to comfortably over 10kt – pretty much as fast as you’d want in a boat this size. Seating is on one of two thwarts or directly on the floor. 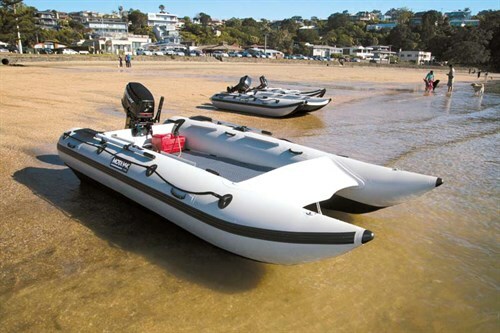 The boat is designed for up to two occupants – ideal for solo fishing or diving – and is available in a variety of colours, including camouflage, to suit the buyer’s preference. The entire boat rolls up into a luggable 32kg bag (excluding outboard) and is easily pumped up in a matter of minutes. Apart from being a fun family craft, this model would be a perfect small fishing platform as well as being a great tender for a yacht or launch. A package including a new Mercury 3.3hp two-stroke motor will be around $2750; it’s $1599 for the hull only.